Flower Arranging Classes: Seats Available! FREE copy of Michael Gaffney’s book “Design Star” with over 400 color photos! Every one of our flower arranging classes provide our students with plenty of flowers. We also offer useful flower arranging information. When students complete our flower arranging course, they leave with a complete understanding of floral design. Our Flower Design school presents intensive floral arrangement classes. We introduce students into the world of the floral designer. If you enjoy creating beautiful floral arrangements then this is the class for you! 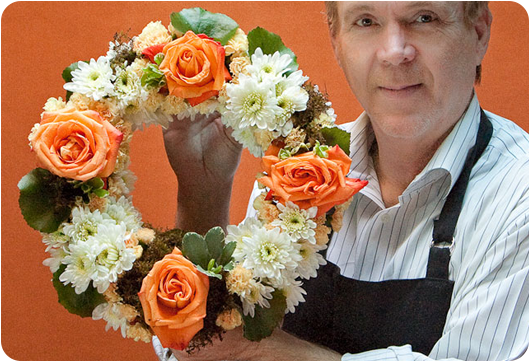 Our Flower Design School teaches classes in floral design for students of various skill levels. Talk to one of our Flower Design experts. We can find the floral design class that’s perfect for you! Looking to become a florist for a floral shop? Or do you simply want to design flowers for your own wedding or personal enjoyment? Our flower arranging classes can help. All our floral design classes are “hands-on”. Students have the opportunity to work with all kinds of fresh flowers and foliage. Our flower arranging classes are kept small in order to maintain a good student to teacher ratio. The founder of American School of Flower design Michael Gaffney has spent years formulating his teaching methods. The result is easy to understand formulas that you can use to create great works of floral design. Michael Gaffney has taught flower arranging classes for television such as the Today Show, Hallmark Channel and every major TV network! Feel free to call 414-617-7162 to chat with one of our flower arranging experts. They can answer any of your questions and even sign you up for a class!